The RM300 million flagship campus is a hallmark of private higher education in the country. Strategically located at a 10-acre site at Kota Damansara, the purpose-built campus has academic library, research and recreational facilities, providing a complete learning experience for up to 12,000 students in this particular campus alone. The Group has 27,000 students in total. If you would noticed that our flagship campus accen tuates a unique architecture, inspired by colonial and roman designs. The impressive layout promotes open spaces and many facilities that adds to conducive learning environment for you. You also get to enjoy a picturesque view of Lake Cova located opposite the campus. As an e-campus, it’s only natural for our University to provide most of its learning materials online within an Internet and wireless environment. This means accessing the online library and tutorial is a click away. We offer a wide range of programmes - from the faculties of Business & Accounting to Health Science, there is something for everyone at SEGi. Over the years, we’ve established strong global connections with top-notch internationally acclaimed universities such as Abertay University, University of Sunderland, University of St Mark and St John, Teesside University and York St John from the UK; Upper Iowa University from the US and University of Southern Queensland from Australia. 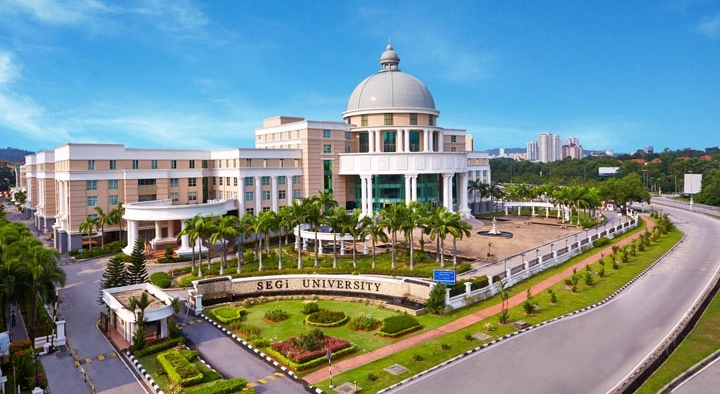 With virtually everything you need on campus and be ing strategically located within city limits with close proximities to The Curve, One Utama and numerous public transport services, SEGi University is the perfect study location.